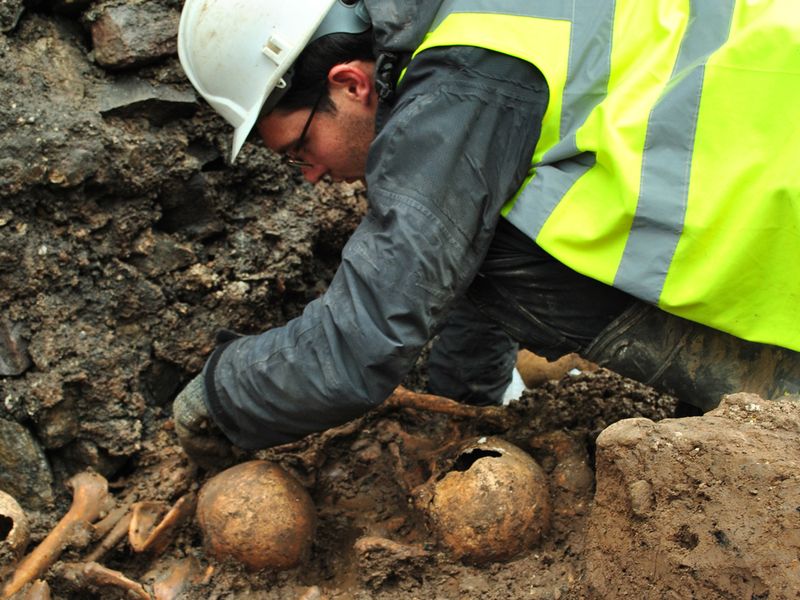 Headland aims to reduce the risk from archaeological discoveries to your project. On occasion, unexpected discoveries of great significance may turn up. Headland has a proven track record in understanding the needs of the planning archaeologist or curator, and developing excavation and recording designs that meet their requirements, while allowing the development to continue. The Old High School is one of Edinburgh’s finest buildings. It was built in 1777 in the classical design popular in Edinburgh at that time and is now part of the University of Edinburgh, and it has recently been converted into the Edinburgh Centre for Carbon Innovation. As with many other buildings of note, there was a requirement for archaeological works both pre- and post-application. The first phase of works involved a rapid desk-based assessment and programme of evaluation and monitoring of geotechnical test pits. This initial assessment provided a background for the development application, and indicated that the construction and demolition of an earlier building within the plot had largely removed any evidence from the medieval period. The limited potential over most of the site resulted in the planning authority recommending monitoring during the main development works. Monitoring is a routine method of identifying and recording archaeological remains in environments where their survival is only patchy and the level of risk is low. Headland provided a rotating team of staff over the course of a year-long construction period, ensuring there was always someone available at short notice. The relationship with the contractor in this situation is key, as they need to understand the scope of our works well enough to know when to call us in, and to feel confident about our role within the team, assisting them through the planning condition. 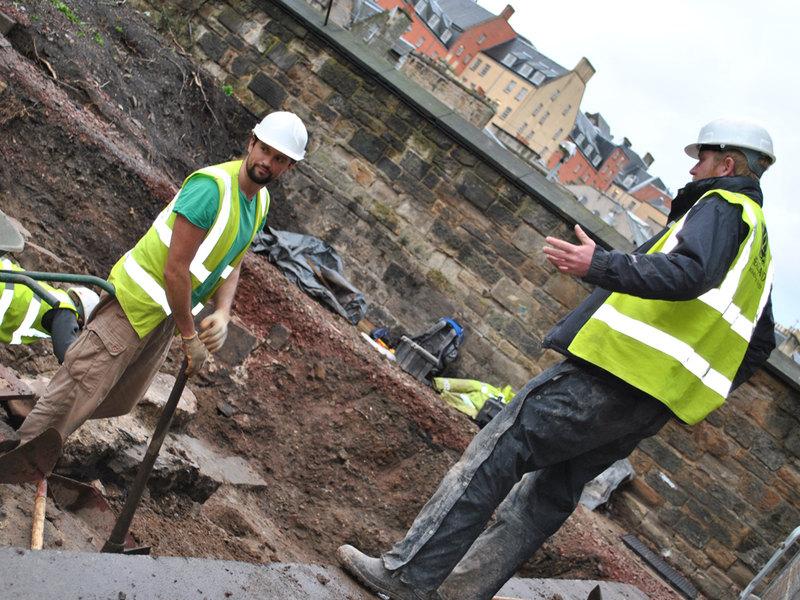 In February 2013, during groundworks being undertaken in the car park (one of the larger open areas associated with the redevelopment), monitoring archaeologists discovered the remains of the 13th-century Dominican Friary. 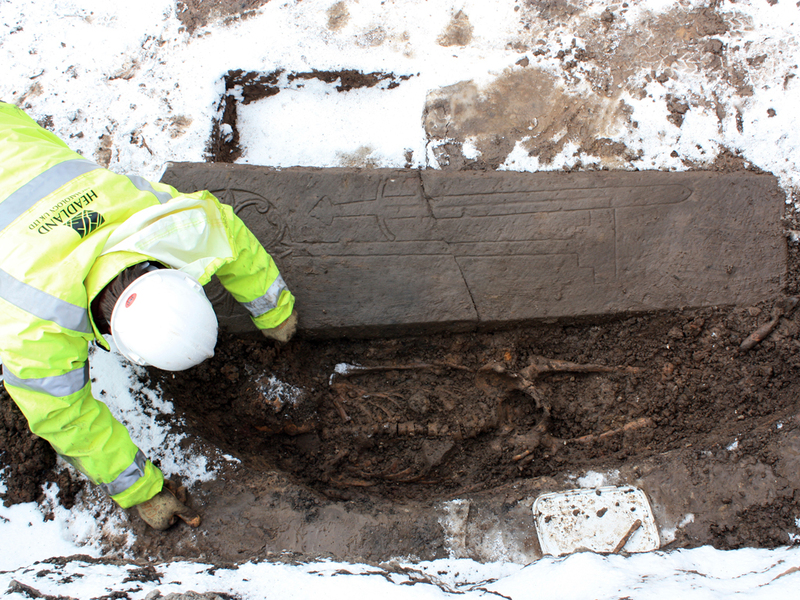 The remains were of such importance that targeted excavation had to be undertaken. However, consultation with the developer and the planning archaeologist allowed much of the site to be preserved in situ within or below the new development. 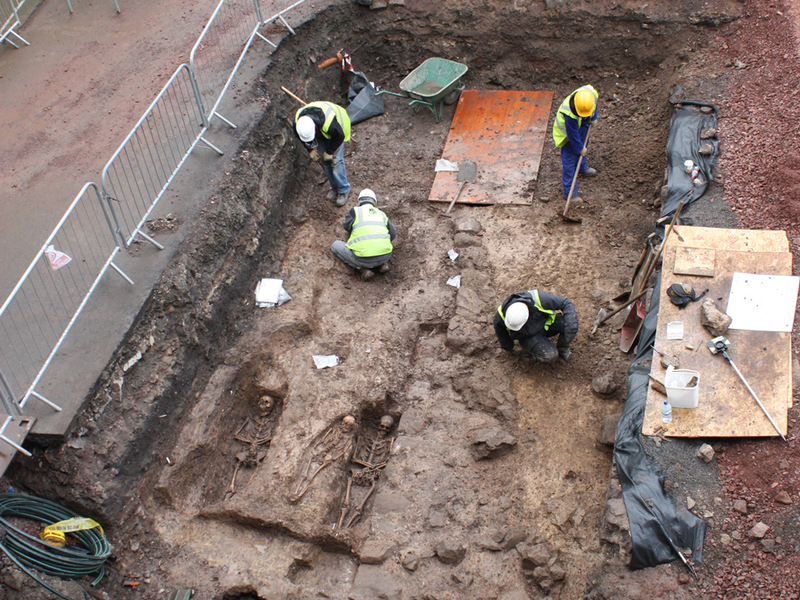 The discovery included foundations of the friary buildings as well as that of the later Royal High School built in 1578 on top of the friary following its destruction during the Reformation in 1559. 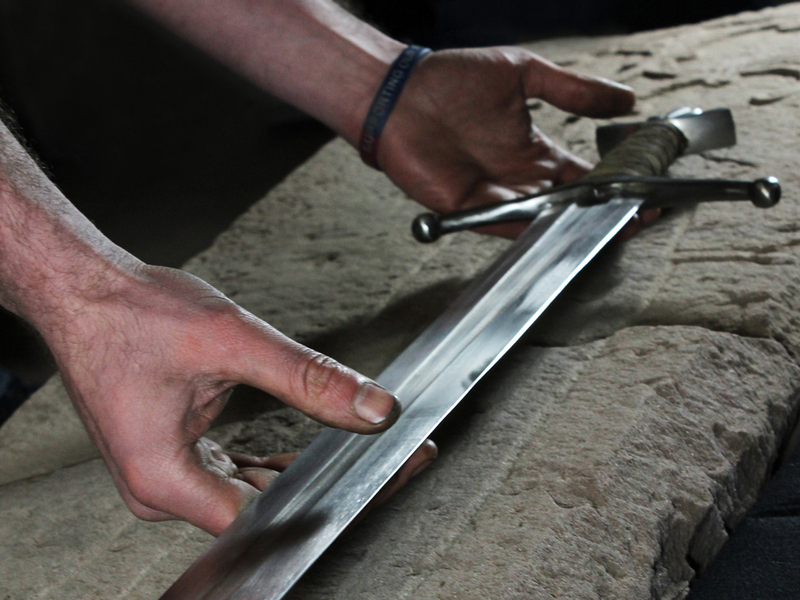 In addition, nearly 100 burials were uncovered from the graveyard associated with the friary, most notably, the grave of probable knight, covered with a rare carved grave slab showing a cross and sword. 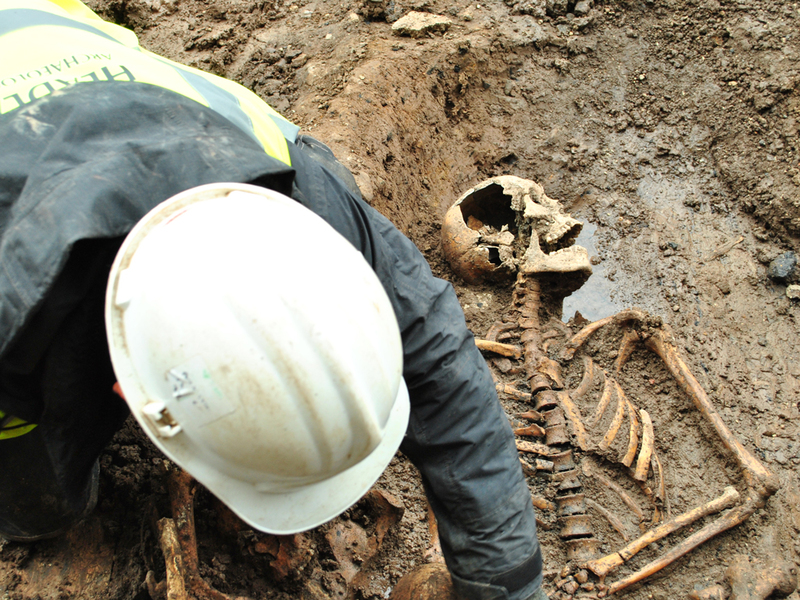 The skeletal remains have been subject to specialist analysis, as part of the planning condition attached to the development. This evidence, along with that from the finds and soil samples taken from the excavation will be synthesised and published. The discovery of a probable knight in particular caught the public’s imagination and Headland facilitated the press interest in this discovery, on behalf of the developer.